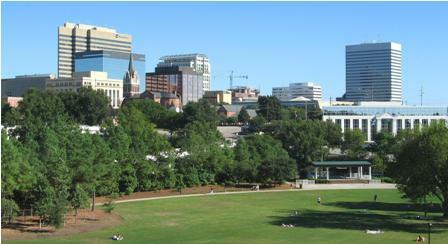 The Granby Mill Village neighborhood is located just minutes from downtown Columbia, South Carolina. This mature neighborhood is located to the southwest of the intersection of Huger Street and Whaley Street near the University of South Carolina. With this central location, residents have easy access to one of the three major interstate systems that surround the city: I-77, I-26, and I-20. Connect with I-77 north, and be in Charlotte, North Carolina in less than 2 hours. Pick up I-26, and be at the beach or the mountains in about 2 hours. Connect with I-20, and find Myrtle Beach, SC in little more than 3 hours or Atlanta, Georgia in little more than 4 hours. No matter where you may wish to go, living in the Granby Mill Village neighborhood puts you on the road to almost anywhere around the city and even the State. Homes in the lovely Granby Mill Village are beautiful two story older homes with high ceilings, fireplaces and hardwood flooring. Homes in this neighborhood average around $150,000.00 and range in size from below 1500 square feet to over 2000 square feet. Many of the homes have been upgraded and include granite countertops and ceramic tile flooring and showers. These homes have plenty of windows and spacious rooms, with some having privacy fencing. No matter what you may be looking for in a home, you will certainly enjoy a bit of history living in the Granby Mill Village neighborhood. Living in the Granby Mill Village neighborhood places residents just minutes from all of the wonderful shopping and dining options in the downtown Columbia, SC area. In addition, you can find a variety of museums to visit, theaters to attend, several local parks to play in, and even a zoo to explore. With the University of South Carolina nearby, as well as several other colleges, there are also a variety of collegiate activities to attend. For those enjoying the outdoors, canoe or kayak one of the two converging rivers that run adjacent to the city or walk, jog or bike one of the greenways along one of the rivers. There is even Granby Park within walking distance of the neighborhood offering a nearby options for a leisure stroll, as well as a bi-weekly farmers market nearby during the warmer months. No matter what you enjoy doing to pass the time, you will certainly find something close by living in the Granby Mill Village neighborhood.